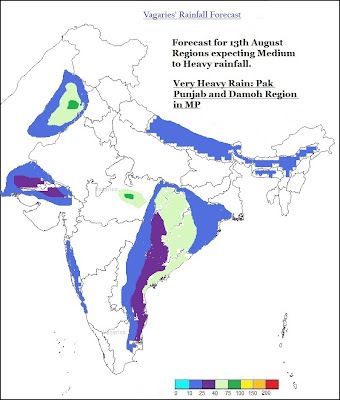 can heat wave in eastern Europe trigger massive rains over PAKISTAN and western RAJ as happened during Russian drought and PAK extreme rains in 2010-11? 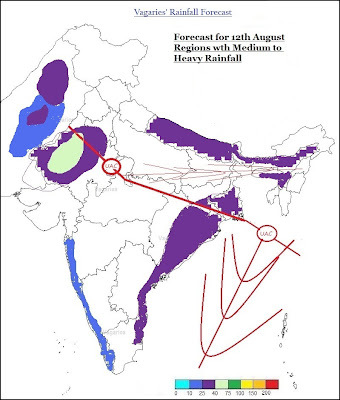 sset: no, the rains you mention were also a result of the jet streams looping down that year...a sort of "Rossby Effect"
hot & humid & sunny weather, now in sambalpur. Nilesh: Though Sambalpur got 8 mms, upto Monday morning, and Monday was hot and sunny, we can expect 10-15 mms on Tuesday, and then maybe less. Seasons total is 557 mms, with 120 mms in August. Parts of Goa witnessed medium to heavy rains since early morning Tuesday 13. Skies heavily overcast through the day with intermittent heavy rains in many parts. Kathmandu has been rainy - as per vagaries forecast - for last three days - 20 mm on 24 hrs ending Sunday evening, 40 mm on 24 hrs ending monday and 60 mm on 24 hrs ending tuesday : raining mostly during the night and late evening. 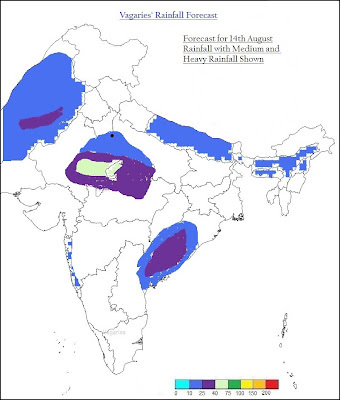 Otherwise, this month , and for most part of the last month, the rains were more sporadic ; heavy at times, but very sporadic ; convective showers i would say ; quite unusual for mid-monsoon. Neeraj: Yes, quite regular rains in Kathmandu. and convective rains are a bit unusual for now...but the Eastern arm needs to strengthen more...and good flow needed from Bay to rusah into Nepal..